This article was originally posted back in April 2015 when we were tired of paying over 0 per month for cable. About 8 months later, our cable bill jumped to over 0 per month! Finally in April of 2016 we decided to cut the cable cord once and for all … which saved us over $1,000 per year. Even though we no longer pay for cable and have several streaming services instead, this article covers important points about deciding what goods and services you are willing to afford. And what things are you no longer willing to pay for? Have you ever lost track of paying your monthly bills … where it ended up costing you a lot of extra money? It certainly has happened to me (unfortunately) … many different times. On several occasions, I have forgotten to pay a bill on time only to get rewarded with a nice hefty late fee. Other times I have had insufficient funds in a checking account that couldn’t cover an automated payment – which generally results in late fees and extra payments. Each of these cases were totally my fault. It wasn’t because we didn’t have the money or the time to make the payments. Rather it was me getting a little too comfortable and yep – lazy with our finances. It seems that every time I let my guard down, I get a slap on the hands. During times like this … I tend to get very frustrated with how I handle our finances. Our latest lazy finance story came earlier this week. The difference this time is that we will actually get some money back – instead of having to pay another late fee. Since my wife and I have decided to start challenging all our expenses, we have been auditing all of our spending. One of our substantial monthly expenses has recently become our cable bill. We have our internet, cable, and home phone bill all bundled together from the same provider. Just in the past 18 months our bill has gone up by over $50 in 3 separate increments. It has gotten to the point that we need to make a change as we are now spending over $158 per month on this service. Yes – that is $1,900 a year in expenses – which is ridiculous. Especially for a service (cable) that we really don’t use that much anymore. Just think about all those dividend stocks we could buy for that kinda money! If I were to cancel everything and invest that money, I could potentially increase our 12 month forward dividend income by over $83! And that is just in the first year alone. While I am not ready to completely cut all of our cable and am certainly not ready to cut our internet service – it is time to make some adjustments. That is when I started closely looking at our monthly bill that we uncovered a $96 surprise. Note – since this article was published … our cable bill jumped another $50 per month within 8 months. The good news is that we cut our cable in April of 2016 and are saving over $1,000 annually. After reviewing our last couple of statements, I have realized that we have been getting charged an extra $8 per month for an internet modem. The only issue with that charge is that for over the past 4 years (since signing up for our service), we have been using our own modem for internet. Since I can only review our last 5 statements, I am not really sure how long this has been happening – shame on me I know! I was able to call and get a $40 credit back on our statement for the billing error for the past 5 months. I also can look into getting even more back by going to one of the company’s service locations and reviewing our past bills. It was my own fault for not catching it in the first place, but I just can’t believe a company would start billing you for equipment you never used or received. I am fairly certain that this extra charge does not go back the entire 4 years. Our first 2 years of service was around $89 per month for cable, internet, and phone. I think it was at some point in the last 18 months when our bill started to skyrocket that we began getting overcharged. My wife and I are still looking at options for cutting part of our cable to make it more affordable and put some money back into our challenge savings account. In the meantime, I was able to get back $40 in credit and am looking for more. 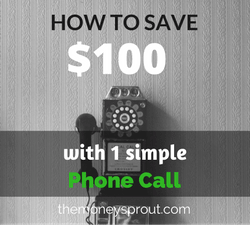 We have also brought our monthly bill down by $8, which translates into a $100 annual savings (actually $96) by making a simple phone call. A lesson learned here is no matter what type of bill or expense, it is a good idea to review your statements. Whether it be our credit card statements, cable bill, car payment, etc. – it is my responsibility to make sure everything is in order. If I hadn’t done an audit of our accounts, I may have never realized we were being overcharged for a service we had never used. 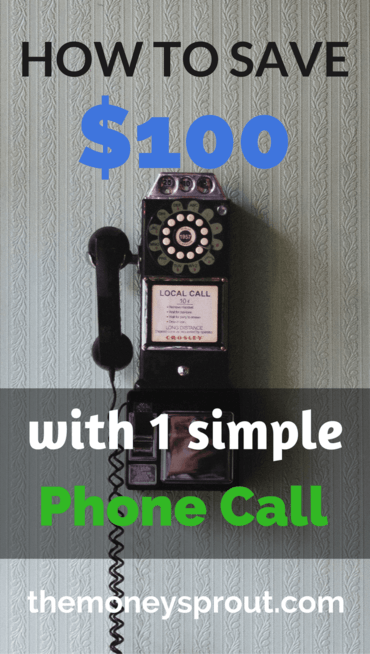 Finally, it never hurts to spend a couple minutes and call your service providers asking for a lower price. From cell phone and cable bills to insurance … it never hurts to call and see if they can offer a lower price. Have you ever been overcharged for a service you never signed up for? Did you ever call a service provider and ask or demand for a lower monthly payment?